Salvia elegans in bloom Salvia is from the Latin “salvere” meaning to save, to cure or be in good health. The French agreed, calling it “tout bonne” or all is well. The majority of historical information refers to sages in general. However, I see no reason that the notoriety shouldn’t run in the “family”. Romans held sage as a sacred ceremonial herb. It was thought to be beneficial for longevity, wisdom and memory. With a long history as a healing herb, it was said to cure snake bites, eye problems, infection, epilepsy, intoxication, memory loss, worms and intestinal problems? And beyond that, it was considered an aphrodisiac! Did you know? 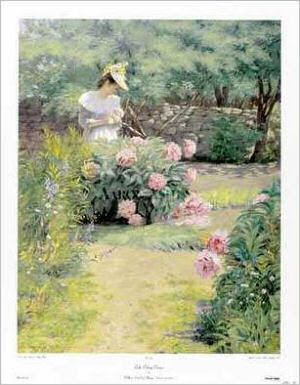 One superstition was that the plant would thrive or wither according to its owner’s fortune. 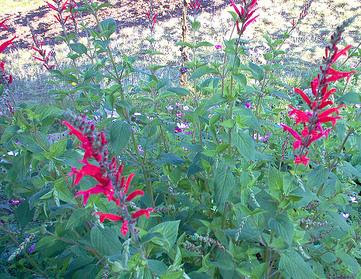 Originating from Mexico, pineapple sage is a tender perennial, growing 12-30 inches tall and 2 feet wide. Leaf: bright green, in pairs, more pointed than other sages; somewhat soft, fleshy and fuzzy, with pronounced veining underneath. Tinge with red as they mature. Bruising the leaves yields a sweet pineapple fragrance. Flower: tiny, deep-throated, tubular, two-lipped, scarlet/ruby blossoms on slender green stalks in late summer; tangy, citrus-mint flavor. Loved by hummingbirds and bees. Seed: tiny, dark brown, ovoid. Stem: Square, turning woody after the 2nd year. The plant can be propagated by lifting and separating clumps or taking semi-hardwood cuttings in the spring. The cutting should be striped of half its leaves and planted half the length of the cutting into the soil. Replace woody plants every 4-5 years. Pests include slugs, spider mites, spittle bugs, root rot and wilt. For companion planting, it is said to improve the growth of carrots, marjoram, strawberries and tomatoes. Because it is a tender perennial, it requires mild winters, wind and sun protection, weekly watering and temperatures above 30oF. I have been successful wintering over my pineapple sage by heavy mulching at the end of the season (before the first frost). Avoid harvesting the first year. Leaves and flowers are harvested fresh. Leaves should be harvested prior to blooming. Unlike other herbs, the flavor intensifies as it dries. Because the leaves are somewhat fleshy, it is prone to mold as it dries. Be sure to dry the herb in a warm, dry place with good air circulation. Nothing smells any better than the sweet, soft pineapple fragrance that this herb imparts. What poor pineapple sage lacks in impressive history, it makes up in culinary delight. The leaves can be used to flavor teas, chopped for use in chicken and pork dishes, cream cheese, jams, jellies and fruit salad. Leaves should be added at the end of cooking time. They can stand in for regular sage in almost any recipe. The flowers, with their citrus-mint flavor, can be tossed into salads and teas. Bring water just to a boil and pour over the sage leaves. Stir in honey and lemon or lime juice to taste. Steep tea for approximately 20 minutes. Bring to a boil and then strain into mugs. The leaves of pineapple sage may be used in potpourri or sachets. The blossoms are loved by hummingbirds, especially the ruby-throated variety and any other late season stragglers. Pour boiling water over leaves and allow to cool completely. Strain and add oatmeal, honey and egg white. Mix until smooth and creamy. Spread mixture on clean skin and let sit for 15-20 minutes. Rinse well with warm water and pat dry. Even if it does have to play second fiddle to its other family members, it is in a class by itself in the culinary arena. Just try a sprig in a jar of sun tea. One sip and you’ll be hooked and pining for pineapple sage! 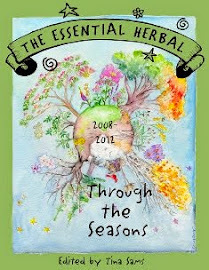 The following is from the May/June '08 issue of The Essential Herbal. It was written by Betsy May, one of our regular contributors. 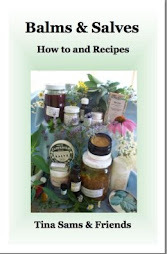 Kloss’s Liniment: (see recipe at end of article) Kloss’s Liniment is a must have for the first aid kit. It kills bacteria, prevents and heals infections, can be used for all types of external problems such as cuts, ringworm, bruises, sprains, burns,sunburn, poison ivy, chicken pox, boils, and more. Bach’s Rescue Remedy: Bach’s is wonderfully soothing and comforting for any type of trauma or stressful event. Peppermint essential oil: Inhale peppermint essential oil to ease nausea and car sickness or when rejuvenation is needed. Lavender essential oil: Lavender essential oil can be inhaled for anxiety and insomnia. Rosemary Essential oil: A great trick I learned from Jeanne Rose to treat headaches is to apply a few drops of Rosemary essential oil to the temples and massage while sipping ½ glass of water with one drop of Rosemary essential oil in it. It works every time! Rosemary essential oil is also wonderful for sore, aching muscles. Tea Tree Essential oil: This antiseptic oil can be used to treat cuts and scratches, acne, and fungus. Yarrow leaves: Yarrow leaves can help stop minor bleeding. Apply to a cut just like a band aid. 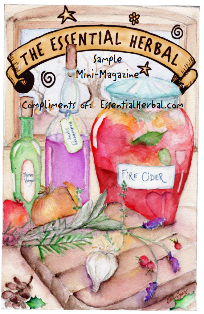 Echinacea Tincture: Echinacea is very helpful for warding off and/or shortening the length of colds. All-Purpose Healing Salve: (see recipe) This great all-purpose salve can be used for itchy scratches, bites and cuts, sores, cold sores, and even hemorrhoids. It speaks volumes for the quiet power of herbs. Cold Care Capsules: (see recipe) This idea came from Rosemary Gladstar. These capsules are helpful to take when you feel a cold coming on. Garlic infused olive oil: Garlic oil works wonders for earaches. Herbal teas: I would suggest having a number of different blends for various illnesses such as respiratory illness, menstrual discomfort, digestive problems, and anxiety/insomnia. You could formulate your own blends or just buy a few boxes. Traditional Medicinal makes a great line of teas for all of these illnesses. During Rosemary Gladstar’s apprentice program we talked a lot about the value of herbal remedies, both at home and while on the road. Penny, one of Rosemary’s assistants for the class, is known among her friends as being a “world traveler” and she shared a lot of great herbal travel tips with us. 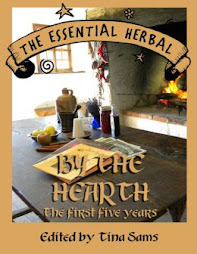 Unfortunately, since September 11, traveling with herbs and tinctures can raise suspicion, therefore it is best to have everything in one small bag, clearly labeled if made by hand or in the original packaging if brand name. Another thing to keep in mind if you are flying on an airplane is that you can now carry only 3 ounces of liquid in a container due to homeland security rules. One other tip from Penny: if traveling internationally, especially to third world countries, is to take a Steri Kit. A Steri kit is basically your own IV & syringe kit if you need to go to the hospital. In some countries these supplies are not always sterile so having your own is a good precaution to protect against blood born diseases. Again, it is a good idea to have Steri kit that is officially labeled so you aren’t questioned about why you are traveling with syringes! Steri kits are available from many companies on the internet. Digestive issues can often be a problem when traveling, either due to overindulging on rich foods, too much take out, or if in a foreign country, from bacteria we are not used to here. There are several items to take with you to be prepared for stomach ailments. Capsulated ginger powder: Ginger capsules are easier to take than trying to make ginger tea and it works the same for nausea. Bitters: Bitters aid the digestive process and can help if constipation becomes a problem. Penny also shared that she found out her bitters double as an insect repellant! I plan to try that out this summer. 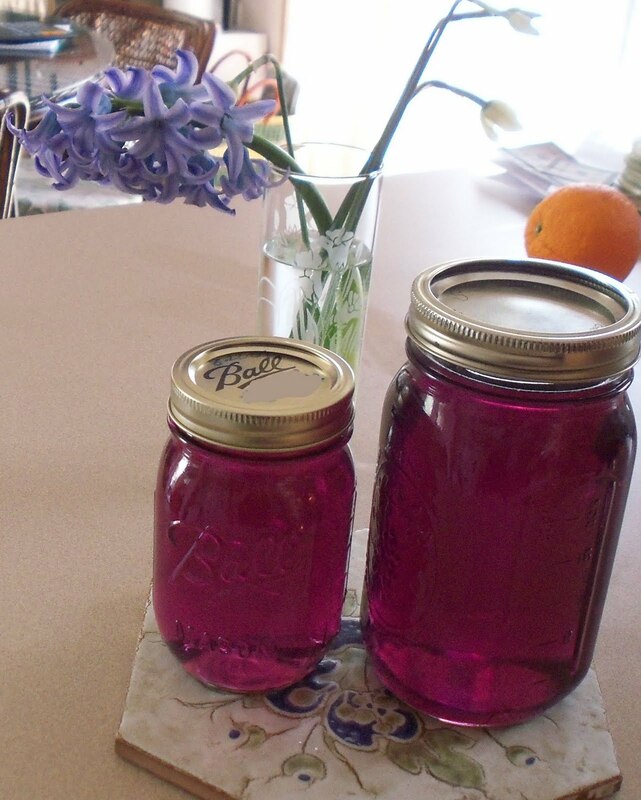 Blackberry Tincture: Blackberry tincture is great for diarrhea. Smooth Move tea from Traditional Medicinals: I’ve found it is much easier to pack a few tea bags than to take loose herbs and then try to find a way to brew and strain them. This tea works wonders for constipation. Other items to include are: Alacer’s Emer’Gen-C packets: These little individual serving size packets are powdered vitamins, especially high in Vitamin C. Just add water and you have a fruit flavored drink. They are great for extra energy, when you are feeling run down, or to help fight off colds. I discovered them several years ago in a health food store and was delighted to find that Rosemary Gladstar also recommends them. Chamomile tea bags: Chamomile tea is an excellent remedy for stressful situations and to help with insomnia that can come from being in a strange place or a different bed. Kloss’s liniment, Bach’s Rescue Remedy, All-Purpose Healing Salve, Echinacea tincture, and Lavender, Rosemary, Peppermint, and Tea Tree essential oils. Mix herbs and cover with one quart of rubbing alcohol. Let it stand for a week or 10 days, shaking every day. Do not take internally. Mix equal parts of goldenseal, echinacea, myrrh powder, and slippery elm bark. Fill “00” size capsules with the herbs. Take two capsules every two hours. Combine the herbs and olive oil & simmer 25 minutes; strain herbs. Add beeswax, stir until melted. Add about 20 drops of Peppermint essential oil. Pour into containers and let cool. This weekend officially starts summer. I've been reading different laments about how the meaning of Memorial Day has become forgotten, and that it no longer is a day to honor our fallen military heroes. Considering that I am in my 50's, and can remember as a tot going to the cemetary with my grandparents to put peonies on the graves of our ancestors (non-military), I suspect that this date has undergone some transformation of meaning. It seems to me that the date has become more visibly in honor of military sacrifice as time goes by. My grandparents spoke of this weekend as always being the one that started summer. Deceased relatives were always honored with flowers and decorations, but as it turns out this day started after the Civil War. (More history) It had little to no significance to *my*relatives in a military/national sense - at least in my memory. The stories I heard as a child reflected how it was unthinkable and disrespectful beyond imagination to neglect the visitation of graves. Families packed a picnic lunch, gathered flowers for decoration (at one point, the day was called Decoration Day), and made the rounds of cemetaries before ending in a park type setting for a picnic and perhaps some games. As my grandparents passed, my mother took on the job of decorating the graves of "her people" on special days. It was always important to have it finished before other relatives got there to decorate other nearby graves, and saw that it hadn't been done yet. I always tried to imagine my grandmother's family (of which she was the youngest of 17) packing everyone up and traipsing around their part of the world. There were probably parasols and cellulose collars. Certainly the women all wore gloves and hats, and there would have been hats and vests, and/or suspenders on all the men. What a sight that must have been. It is right up there with the image I carry from her stories about how her father would rent a "barge" for them to take out on the Susquehanna river to fish for shad and eels in the summer. I grew up during the Viet Nam Conflict. Always was and probably always will be a peacenik. That does not mean that I do not honor and thank the men and women who have sacrificed for me and the country I love. That means that I believe we need to find ways to live together without sending our young people to fight and die. To me, patriotism is not synonymous with war, yet I see that being the case so often. This time of year is always incredibly hectic. There are the festivals, market starts up, gardening groups have programs and need speakers, and then there are the plants and gardens. This year I have a child preparing for graduation as well, so there's a ton of stuff happening here. I open my eyes in the morning, swing out of bed, and don't stop until my head hits the pillow 16 or 18 hours later. Only a few more weeks of this pace, thank goodness. Last week was the Landis Valley Herb Faire. Susanna Reppert and I hatched a scheme over the winter to have speakers there. Susanna did the work and scheduled talks every 1/2 hour in 2 different locations for almost all of the hours of the 2 day festival! She did an amazing job of it and up until about mid-afternoon on the second day, the talks were a huge success. The faire itself winds down a few hours early on Saturday, so it wasn't a surprise. Even so, my last talk (wild food plants) at 3 on Sat. still had 5 or 6 rapt listeners. So Kudos to Susanna for the hard work! 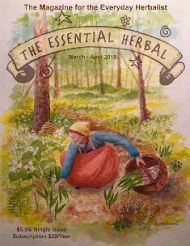 I managed to get a couple of pictures of The Essential Herbal magazine readers. Barb King came right up and introduced herself (I LOVE subscribers who let me know who they are :-), and then Susan Hess and Jen Stradling appeared together. It is really so much fun to see and meet TEH folks. I wasn't quick enough with the camera to capture many of the others who stopped in to visit. This is the view from our side of the booth. The gardens are coming along too. Our "safe to plant" date is May 15. Last night the news guy said there was a chance of frost, but it looks like that didn't happen here. I got some veggies planted the other day. The perennial plants are starting to really pay off. The blueberries (below) are responding to the fence I built around them and the lack of vermin nibbling off their tender tips. Look at the blossoms! The elderberry is enormous and there are three delicious mints all making their way across the yard - lol. Perennial culinary herbs like thyme, chives (top picture), tarragon, mountain mint, sage, and oregano are enormous, apparently happy to have been well mulched last year. Out front, the bleeding hearts are giving way to some of the more summery flowers. This one below *I think* is called batchelor's buttons. My mom adored it and called it "bluet", but bluets that I know are small dainty four petaled posies that scatter across the lawn like stars. Our famers market has started and we are heading into the 4th week now. We have some regulars sniffing the Yuzu salt spa bars below. So far it has been a blast. We are doing a short (2 page) newsletter every couple of weeks for Main Street Mount Joy, and that means interviewing vendors and customers along with photographing them. It's a lot of fun. Toss in a recipe or two that highlights the ripe produce, and there it is! J and J Plants from Conestoga is a vendor at our market. They bring some awesome, unusual stuff. This broom came from them last year. I notice he has scarlet this year. The blooms are about triple the size of the typical pale yellow broom. It is gorgeous. See ya soon! We're working on the Jul/Aug issue of the magazine right now. Hang on - it's going to be another great issue with a big surprise right up front. A few days ago, my sister and I took my daughter out to purchase the white dress that will serve as her graduation "gown". Her school does not get the gown and mortar board, the girls all wear white dresses. We had a great time, and Molly chattered and laughed. It was good. Last night I took her for her prom gown. She tried on a bunch of dresses, looking terrific in all of them, grousing about non-existent body issues, and we did more giggling and gabbing. We ran into some of her friends at the second store. They were with their mom (I went to school with her...) shopping for dresses for a wedding. Soon Molly's bff Lisa showed up and the whole gang of us took over the dressing room while the girls modeled their choices. We wound up getting our hair done and giving Lisa a ride home. I can't stop thinking about my mom now, Ja-Ja to our kids. Our mom raised 5 kids alone. She didn't get any support, so she started a home business so she could keep the family together. In those days, the most prevalent recommendation was to "farm us out" or give us up to the state. As the late 60's approached, Mom was faced with raising 4 teenagers. The oldest daughter was married and out of the house. It was a hard life for Mom. I'm sure she was lonely and frightened much of the time, and it is hard for me to try and put myself in those shoes. As time passed, she sold the business and took a 9-5 with the Commonwealth of PA. Her life got easier, and there were things like insurance and days off. We grew up--- or as her friend Mr. Malloy would say, "she drug us up". And so it was. She always told us that she raised her kids, so she wouldn't be babysitting for us. That was while we were young. At a certain point, the youngest of us was heading towards 30 and there weren't any grandbabies. Mom decided that perhaps she'd like some babies around - PLEASE! Fast forward to Molly's long-awaited birth. I think I was pregnant with her for 6 or 7 years if you count all the trial and error of infertility. Mom went along with me for an ultrasound the day before Molly's birth was induced, and fell in love in that instant. She took care of Molly while Maryanne and I built the herb shop business. She took her everywhere... they'd get their hair done together, go visit Mimi (Mom's mom) and then stop at some posh restaurant (Molly loved candlelight). They'd go shopping or to dance lessons or whatever they felt like doing. She was so kind, loving, and generous with my daughter, saying she deserved to be spoiled. I know in my heart that for Mom, taking care of Molly was an opportunity to get it right and do all the things she'd wished she'd been able to do for us when we were kids. Mom always told me that she wouldn't be here to see Molly graduate. I would just laugh and tell her she'd be at her wedding. How could there be a world without Mom? Of course she'd be there! Mom died about 4 years ago. Somehow this month has already been more emotional than some that were very close to her death. I think about how proud she would have been. Molly has turned into a wonderful woman, filled with life, creativity, brilliance, personality and wit... all things that Ja-Ja gave to her. As the days march towards graduation and beyond, I won't forget everything she gave to Molly. And as we approach Mothers Day, I just want to thank my mom one more time. I noticed that this hasn't been posted on the website for the faire yet - nor any mention of speakers at all, in fact, so hey... this is better than nothing. Susanna Reppert put this schedule together and we hope some of you will get to hear some of the talks! They are free to those attending the faire. The faire is May 8th and 9th. My sister and I have been vending there for 15 or 16 years now and love to reconnect with vendors and customers. NOON Creating a Sustainable Back Yard – Homegrown Edible Landscaping Company. For many years now, long before The Essential Herbal existed, we've made violet syrup. It isn't medicinal - unless you consider the incredible luxury of it, or the whimsy, or the pleasure. Yes, now that I think about it, it is very medicinal. This batch was made on the eve of May Day, so it is some of the most special ever. In any case it was always one of Molly's favorite things to help with. At three years of age, she could feel pretty important and accomplished. The less stem, the better, and everyone knows little kids just pop off the flower with no stem. Yesterday she wasn't home, but I heard the weed-whacker in the distance and decided it was time to go pick violets. What follows is the results and the directions. I walked down the path with a bucket, picking all the way. The different colors of blossoms blended together to make a wonderful bouquet, and sticking my schnoz in the bucket, I was able to inhale the fleeting sweet treat that is the scent of the violet flower. Note the blues above. The recent record hot weather seems to have affected the flowers and their color. A quart jar was about 3/4 packed with the flowers when the picking was done. A hamstring muscle was screaming, but don't those flowers look pretty? Meanwhile, about a quart of water was set to boil. The boiling water is poured over the flowers in the jar. Notice that immediately the water turns a shade of aqua blue? That color deepens to a cobalt blue as time passes. This color is very odd. Violets usually dye the water some shade of pink, lavender, mauve, or purple. This blue is why I think the temperatures have changed the quality of the color. Here we strain the flowers from the water. This water is then set to boil with about 2 cups of sugar. It was 3 cups of the violet water to 2 cups of sugar. It is allowed to come to a rolling boil. If there is any scum, it should be removed. There was none with this batch. The syrup was poured into two pint jars. Each jar got a single drop of rose geranium essential oil. The color of the syrup was inky kelly green last night. It needed to settle down! This morning I strained the syrup again - for good measure. This cheerful color is how it turned out. Nature... ya gotta love her! Doesn't that look like something that fairies might pour on their crepes? NOTE: Later I added some lemon juice and it turned pale PURPLE. 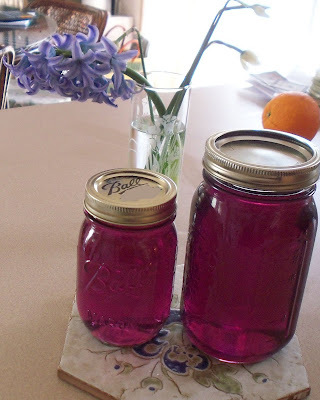 If you want to try violet jelly, check out Prairieland Herb's blog! .Just comment on this, or any of the other blogs participating for a chance to win one of ten pins to be given away. MAKE SURE YOU LEAVE A CONTACT email.Remember all of the blogs below are participating, so visit all of them and post to increase your chances of winning. 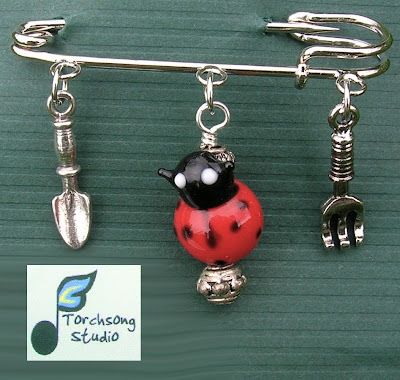 Torchsong Studio Our final contest - check back on May 8 for the list of winners! Thanks everyone for participating and for playing! This has been a fun way for us all to learn a little more about how the internet can work for us. It has been interesting for us all!